A mean, mean man presented this little guy with what he claimed was a “new kind” of Kinder Ovo, an egg-shaped chocolate candy. It was egg-shaped all right. We’re all going to hell now. (NSFW: Language) YouTuber Tim King and his friends held a secret society-themed birthday party. Then they ordered pizza and received the delivery man in character. Dude sounds like Seth Rogen. With the intent of proving that stress can really make you sweat, Nivea played a horrible prank on perfectly innocent people sitting in an airport. We’re just glad there were no citizen vigilantes around. From the sound of the siren in the background, we’re guessing the guy in this clip was being chased by the cops, and that’s why he’s in such a rush to order his two sweet teas from Mickie D’s. Magician Rahat milks his car seat costume for all it’s worth and messes with even more drive-thru attendants. As a YouTuber suggested, he should try combining this with his other tricks. YouTuber LesStrapontins demonstrates Pavlovian conditioning using his own brother as a test subject. The experiment is a success, both in terms of the results and the subject’s learning curve. After pulling up at drive thrus with floating objects, magician Rahat wears a car seat costume and proceeds to creep the hell out of more fast food crew. The victims’ reactions are awesome. An excerpt from an old Japanese TV show featuring a nasty prank. They filled a narrow street with wooden boards that have been coated with very strong adhesive. The fun starts at 1:15. NRK SÃ¸rlandet thinks they’ve found the world’s most easily startled man. Basse Andersen’s fragile frame of mind has made him a frequent target of pranks. He knows it’s all in good fun though. YouTube prankster Roman Atwood and his friends scare the crap out of people – and dogs – with an awesome half-body dinosaur costume. Watch out for the dino loving dude. Jimmy Kimmel Live asked coffee lovers if they could tell the difference between regular coffee and Starbucks’ ridiculous $7 coffee. Except the test was twice as dumb as the previous iPhone prank. A nasty prank from a popular Brazilian TV show. The victims are in an elevator when the power is suddenly cut off. Then it gets worse. To be honest we were also afraid for the girl. YouTuber Andrew Hales aka LAHWF descends upon the hapless students of BYU – home to the nicest kids in America – to play “Guess Who?” with them. Spoiler: He wins every time. Mediocre Films continues their little experiment to see how people react when a stranger crashes their phone conversation. We’re surprised some of them hold out so long. Check out part 1 here. Halloween may already be over, but a creepy illusion is never out of season. Magician Rich Ferguson shows off his impressive skills by taking his head off. Those kids are now afraid of sneezing. Norwegian comedy troupe Ylvis messes with the minds of riders with their “voice-activated elevator” prank. The elevator clapper is classic, but Donald Duck gets on our nerves. More here, here and here. Redditor slapshotten11 lives in the same town as Adam West, aka Batman from the 60’s TV show. 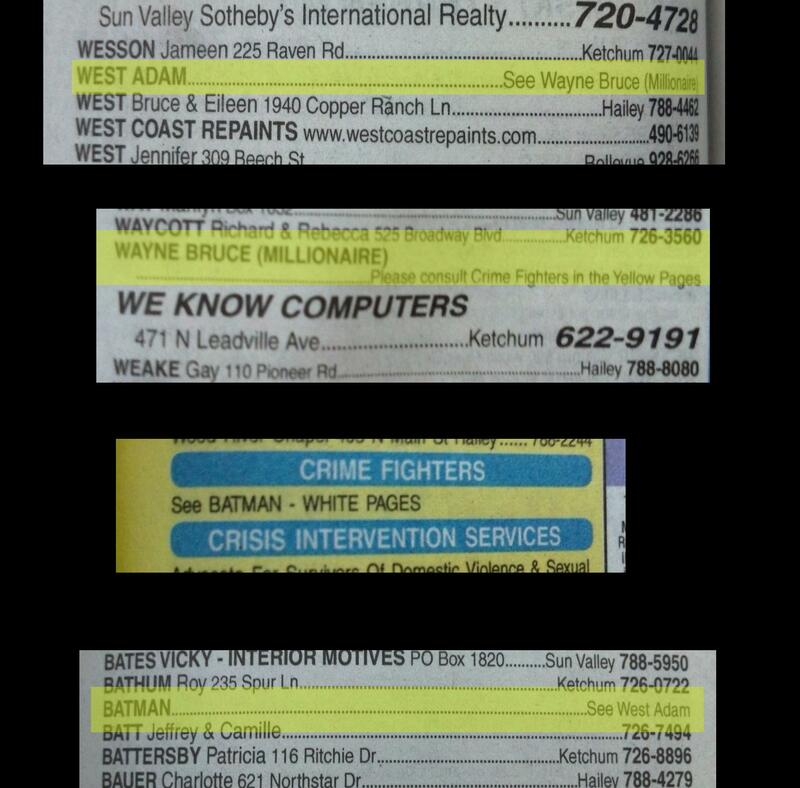 Slapshotten11 looked up West in their local phone book and uncovered a hilarious Easter egg. Basketball legend Bill Russel asks Uncle Drew to get his old team back together to teach the young blood a lesson. Drew’s first recruit is Wes, a tall sharpshooter. Does Wes still have it? The pranksters from ImprovEverywhere take over the office chair section of a Staples store, and hold a fake board meeting for a non-existant company. Needs more PowerPoint, though. Biff Henderson is the stage manager for the Late Show with David Letterman but he’s also appeared on the show, including this hilarious bit back in 2001 about testing people’s patience. Here’s the daring YouTuber LAHWF with another one of his social experiments, aka pranks. Fortunately for him the kids at Brigham Young University are so nice. They even smile when chasing burglars. If you ever find yourself in New Zealand, beware of Robert Hoffman: actor, dancer, choreographer, Dubstep Greeter, Dance Assassin, Punchrobert and most importantly, The Urban Ninja. The pranksters of Awesomeness TV couldn’t sit idly by while throngs of Apple fans waited anxiously for the iPhone 5. So they did what any troll would: pretended to drop boxes of phones in front of them. Pilot Ryan Johnson will have no doubts that his wife-to-be stays cool under pressure after the bold stunt he pulled of tricking her into thinking that their plane was not responding before proposing. Behold: the power of marketing. Before the iPhone 5 came out, Jimmy Kimmel went to the streets to ask people what they thought about the new iPhone 5. Except they showed them the iPhone 4S. A man freshens up the old Coke and Mentos trick by adding a condom to control the chaos. This might as well be an ad for Durex, what with the display of toughness of their product. A dental patient got the ride of his life when he came in for an appointment in a clinic manned by the Impractical Jokers. He should’ve said “Oh no you didn’t” after they raised him up. After messing with one unsuspecting elevator rider, RÃ©mi Gaillard is riding the lift once more, and wants to make you an offer you can’t refuse in his latest prank. Clearly asking for trouble, Roman and Dennis pretend to be taggers, spraying already graffiti-covered walls with a air duster as cops approach – first ready to arrest, then just plain confused. Sick of seeing the filthy Cheeto-covered mess of a keyboard in a co-worker’s office, one Redditor decided to turn the disgusting grimy thing into a planter while his buddy was out of the office.